We have posted this song lyrics in image formet, so you can download this song lyrics and you can use this lyrics at offline and anytime anywhere. ami dubte raji achi, ami dubte raji achi.!! sokal amar gelo miche, bikel je zay tari piche goo. rekho na ar, bedho na ar kuler kacha kachi.!! 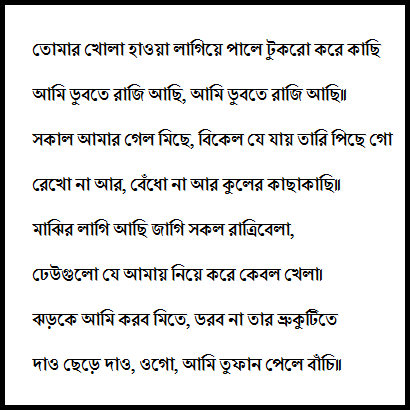 This bangla song is very popular robindro songit in bengali. Most people like this song for their lover. Here we have shared this song only for you, because you like this type of song. If you want to get more song lyrics like this, please inform us, we will try our best to share your favorite song here. Every song talk the soul of human. Song can keep our mind cool and fresh. This song lyrics really make fresh human heart. So dear friends, take your favorite song lyrics and make your moment more romantic with your favorite person.